We offer Advanced Neo Plasma/PRP Treatment/PRP Therapy for Hair Loss & Face Rejuvenation in Delhi. PRP and that too at best cost/prices. PRP is best for Face Tightening & Wrinkle Treatment as well. Go through the complete guide about how we follow the procedure and why we get the best results after the Neo PRP Therapy. How Much Money and Recovery Time is Required for PRP? How Safe is a PRP for the Hair Loss Procedure? What is the Effectiveness of PRP? How Can PRP Blood Help Re-Grow Hair? So many of you may be wondering about what exactly is platelet rich plasma? Well, the blood in a living being is majorly a liquid called as plasma. That plasma also consists of specific compounds such as white blood cells, red blood cells, and platelets. All of these compounds individually as well as collectively play a crucial role in the body. Platelets, in specific, however, play a specifically significant role when treating skin conditions, hair fall, hair loss or healing injuries. Platelets for all of us are best known for their capacity to clot blood – like when we get a cut or wound. But platelets are also plentiful of hundreds of distinguished proteins known as growth factors. These Growth factors play a crucial role in the healing of injuries and skin conditions. By stuffing our body with platelet rich plasma, we may have the finesse set in motion and kick-start our body's natural healing mechanisms. Platelet rich plasma has 5 to 10 times higher concentrations of platelets as relative to normal plasma. Platelet rich plasma, also termed as PRP, is a unique healing formula extracted from a person's own blood. This distinctively designed formula has been widely promoted in past few years for its capacity to treat hair loss, alopecia conditions, face-life and face rejuvenation, healing sprained joints and sore tendons. PRP means to have platelets in abundance that are concentrated in a small volume of plasma. The rich concentration of different proteins (growth factors) those are highly competent in tissue regeneration, healing and new vessel production. Currently, PRP therapy is most commonly used in treatment of hair fall, hair growth and baldness. PRP Injection has been in use for many years to speed joint, tissue repair and tendon and is a most famous treatment for professional athletes such as basketball players, football players and golfers. Platelet Rich Plasma has achieved crucial patronage from popular athletes like Rafael Nadal, Tiger Woods and some others. These athletes have attributed PRP with supporting them resume to compete and their athletic activities more rapidly after a muscle, connective tissue or joint injury. How is PRP treatment done? Platelet Rich Plasma is an OPD procedure that takes around 45 to 60 minutes for the completion. A little amount of blood (equal to routine blood tests) is extracted from the patient. This blood is attributed to double spin centrifugation methodology to achieve plasma rich in platelets. The system of processing and secluding PRP therapy is very vital. It should be optimally suffice to receive a platelet concentration of at the minimum 300 to 400% higher than the whole blood. That is regarded as therapeutic PRP. Any platelet concentration less than this will just not be effective and a concentration more than this would barely offer any additional advantages. The plasma so attained is then injected into the affected part of the body within 10-15 minutes of processing. Then the patient is being called upon for the next session within after 15-30 days. Besides this, there are some more techniques to use PRP injection like; the obtained plasma can also be applied over the scalp after microneedling puncturing of the area. PRP is also incorporated as an adjuvant in hair transplant procedure. Which Conditions Can Be Treated with PRP Injection ? There is an amassing proof of efficacious and advantageous results with the use of PRP injection in different dermatological conditions like hair loss, hair growth, scars, thermal burns, wound healing, ulcers, and facial rejuvenation. The most common use of PRP therapy is treatment of hair loss, alopecia, wrinkle and skin rejuvenation procedures. The people experiencing patchy hair loss, thinning hair, receding hairlines, male and female pattern baldness amongst men and women sees an improvement with PRP therapy. PRP for hair loss treatment can also be used along with other topical and oral medications such as minoxidil and finastride, and also as a supplementary to hair transplant. PRP treatment provides positive results in patients with hair loss, but may not be as hugely effective as in completely bald scalp surface, as this treatment may not be powerfully operative to help grow all new hair but rather immensely helps strengthening of existing thin and weak hair. It is suitable to opt for PRP when you significantly notice scanty scalp so that you are able to restore your hair and even regain in long run. Skin conditions such as facial rejuvenation, face lift and wrinkle reduction treatment can also yield benefits with PRP. The PRP for skin rejuvenation treatment can also be used in conjunction with hyaluronic acid based dermal fillers and laser re-surfacing non-surgical procedures. Back and neck injuries, ankle sprains, tennis elbow, tendinitis, and ligament sprains. PRP has great concentration of platelets that on activation produce huge amount of growth factors as PGDF (platelet derived growth factor), EGF( epithelial growth factor), TGF (transforming growth factor), and VEGF( vascular endothelial growth factor) etc. These growth factors trigger expansion and variation of stem cells to hair follicles, extended period of survival of existing hair follicles and strengthening hair follicles. Treatment with Platelet rich plasma also allows for stimulating new hair growth and reinforces the thinned out hair follicles and curbs hair loss. The PRP procedure needs about 4 to 8 sessions at an interim of 5 weeks to 2 months. The favorable or expected results are generally observed over a time span of 9 to 12 months. The cost of the PRP treatment differs from clinic to clinic, physician to physician, expertise to expertise, location to location and also depending upon sophisticated or upgraded equipments used. It varies from ₹4s000 to ₹15,000 per sitting. PRP for hair loss, skin rejuvenation or tendons is a completely safe procedure. The only inconvenience caused to the patient is the discomfort of multiple needles piercing while withdrawing of blood and injecting the same into the affected area. A numbing lotion can be applied over the scalp to reduce the pain of piercing needle. The major risk associated with PRP is that of poor preparation of PRP, obsolete instruments and inaccurate skill of doctor thus resulting in an undesirable or less than effective outcome. People with certain blood disorders or on specific medications are not the eligible candidates for PRP treatments. For patients seeking PRP is on anti platelet drugs like Aspirin or non-steroidal anti inflammatory drugs, are asked to discontinue these drugs 15 days before the procedure. Many clinical studies and healthcare researches have shown the favorable results of PRP in male and female pattern type of hair loss. PRP procedure has been observed to increase hair thickness, minimize hair loss, strengthen hair follicles and even help to promote hair re-growth of dormant hair follicles. It is a newer hair loss treatment that is still to be thoroughly researched, so it is presently being used as an adjuvant or a secondary line approach for the patients not responding well to minoxidil and finasteride. But if the results keep on deriving like this on a positive track, then it could certainly enter into the first line treatment or the permanent solution for hair loss. Male or female pattern hair loss is a continuous genetic condition. PRP may render a temporary advantage but maintenance therapy is needed to restrain recurrence. If a patient approaches some talented, skilled and experienced dermatologists or skin surgeons, only 1-2 treatment sessions may be needed per year with the persistence of results lasting for the maximum duration of about 10-12 months depending on the patient's response. To form platelet rich plasma, a doctor must first withdraw blood from the patient. After this, the doctor separates the platelets from other compounds in the blood. Using double spin centrifugation technique, the doctor then escalates the concentration of platelets. Finally, the plasma with the greatest concentration of platelets is blended with the remaining blood. In normal language, the PRP is formed using a patient's own blood. That withdrawn blood goes through a special process that concentrates the most worthy components – known as platelets – so it can be re-filled to the body for its healing properties. After preparing and obtaining platelet rich plasma, that blood is cautiously injected into the affected area of your body. At this point, some expert dermatologists and scientists believe that platelet rich plasma works –even better than ordinary blood. The treatment therapy is yet comparatively a new procedure and more research requires to be performed to determine exactly how well it can perform for extended processes. In spite of that, platelet rich plasma is thought to work by putting platelets directly where they are ought to go in the body. The platelets are instantly used by the patient's body to encourage the healing process. Apart from, hair loss, hair transplant or facial rejuvenation treatment, PRP can be optimally used to heal a terrific injury called Achilles tendonitis, for example, Achilles tendonitis is an injury that causes the heel cord to become painful, swollen, and inflamed. Using Platelet Rich Plasma and local anesthesia, a doctor will directly inject the solution into the inflamed tissue. Most commonly, this alleviates the pain in the injured area for a few days or weeks after the first injection. Over a long period of time, however, the patient counters a minimization in pain and quick healing from injury. Platelet Rich Plasma can also be created in a special way that allows it to be stitched into ripped tissues. This is beneficial for treating injuries in the location where the tendon is severely separated or torn – for example, torn heel cords that need surgery. By stitching Platelet Rich Plasma into these cuts or wounds, specialist may be able to accelerate the healing process. PRP treatment is now being provided at the clinics all across the world. But all the service providers are not worth your money, reliability, energy and efforts as many of them are not only unauthorized but are making use of outdated equipments and delivering substandard and unsatisfactory results. With an instant Google search, you would be able to discover a specialist or clinic or facility offering the best of the PRP treatment. Platelet Rich Plasma treatment typically takes 2-3 hours, which includes the preparation and recovery time as well. PRP procedures are carried out safely and hygienically in medical clinics. The treatment is fulfilled without the need and risk of surgery, local anesthesia, or days or week long hospital stays. The one “catch” with Platelet Rich Plasma procedure is that it is required to be performed multiple times. Up to 3 injections may be administered within a 6 month span of time. However, a huge number of patients will experience substantial relief from their ailments and injuries soon after coming in contact of the 1st or 2nd injection. Within the initial 15 days of PRP procedure, you should observe increased pain in the injected area of your body. Between 2 to 6 weeks, however, you would experience a steady decrease of pain and discomfort. PRP has initially been started researched in the 1970s. It was not until 1987, however, that Platelet Rich Plasma was first used in surgery. It was initially used in an open heart surgery in in 1987 in Italy. After successfully being incorporated in that surgical procedure, PRP emerged out in popularity commencing in the mid-1990s. Currently, it is being executed to a variety of medical fields, including cosmetic surgery (hair transplantation, hair loss, and facial rejuvenation), dentistry (gum diseases, ulcers and others), sports medicine, and pain management. Specialists are able to re-grow hair in balding and thinning hair patients with a sequence of injections called as Platelet Rich Plasma therapy. 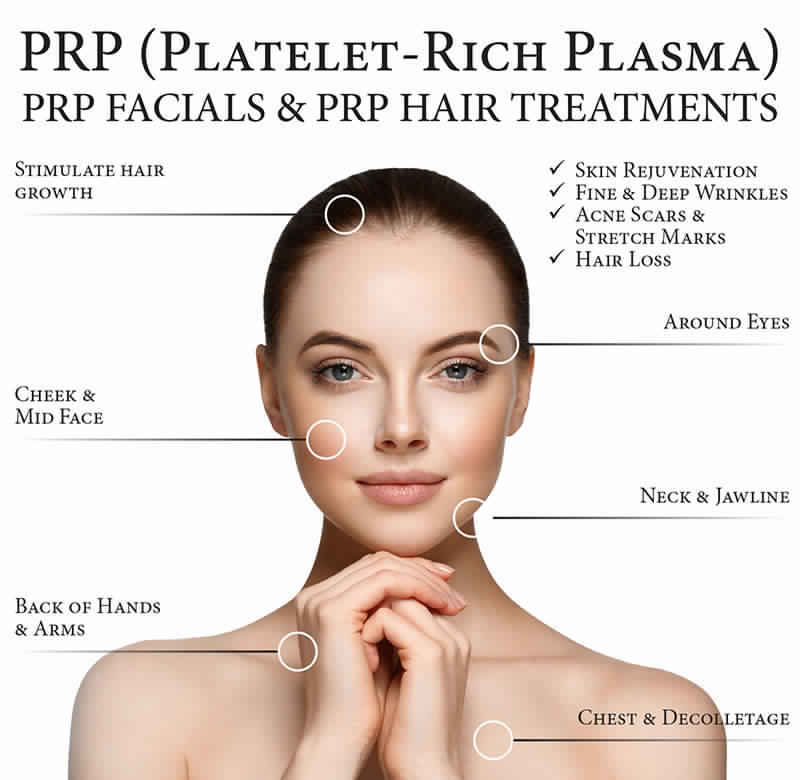 Platelet Rich Plasma is not unfamiliar, and researchers have some time ago started exploring its competent role in hair re-growth and as per their study and clinical experiments, they were able to obtain desirably positive results for the purpose. The treatment involves drawing the person's blood and whirling it in a centrifuge to set apart the plasma from the white and red blood cells. After filling up nutrients such as protein, the platelets and growth factors are gathered from the sample and injected into the scalp where there is balding or hair is thinning. The treatment is non-surgical and needs only general anesthesia. In the case of hair loss or hair thinning, the injected platelets stimulate dormant or newly implanted hair follicles to enter an active growth phase, leading the hair to begin to grow all over again. Who is an ideal candidate for PRP? PRP aims at providing optimal treatment for alopecia, androgenetic alopecia; the genetic hair thinning that impacts both men and women. Specialists thought it may also be favorable for females with traction alopecia, hair loss or thinning caused by extremely tight braids, ponytails, and other hair styles that pull the hair out. According to scientists, the ideal candidates for PRP for hair loss treatment are people who have started to lose or thin out hair. Platelet Rich Plasma might not effectively function for anyone who is experiencing prolong completely bald scalp and it may not completely re-grow all lost hair. Clinical research and subjective experiments about the optimality of Platelet Rich Plasma and the longevity of results are indecisive in a way that different patients respond distinctively to the treatment as no human body share a similar chemistry both biologically or scientifically and thus the effectiveness of this or any cosmetology procedure varies from patient to patient. Another point is that patients have a different medical history or may have a certain medical condition that has triggered the disease. And another most critical point of consideration is that, due to the reason that there is no standardized procedure and different providers implement different injection formulas, concentrations, instruments and techniques. Here we will make you familiar of a few clinical studies to know the effectiveness of PRP in treatment of hair loss. A researcher conducted a study, collecting 11 patients in whom found a notable reduction in hair loss” between the 1st injection and the 4th, and noticed a significant increase in the average number of hair follicles/sq cm of the scalp. Another clinical study conducted with 20 patients deduced that Platelet Rich Plasma “may have an effective therapeutic effect” on patients having androgenetic alopecia; male and female pattern hair loss without any side effects. 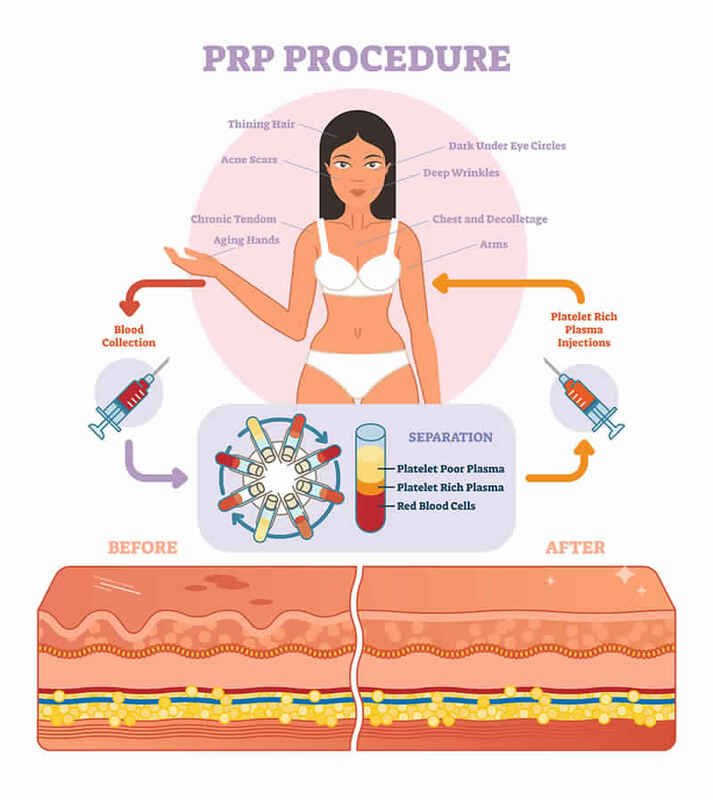 PRP, in recent years, since its inception, has managed to build a reputation among cosmetic surgeons, dermatologists, sports medicine doctors, dentists, and orthopedic doctors and even the tried and consumed patients as an effective technique. “PRP is established as a promising, minimally invasive, safe, and cost-effective treatment”, no matter what many researchers say that some placebo-controlled or randomized experiments are still needed to be undertaken to further investigate its efficacy.